Senate Majority Leader Mitch McConnell (R-Ky.) made the same assertion Sunday, saying the U.S. Senate isn’t broken. Since then, he’s earned a 91 percent pro-Trump voting record. Other Republicans have shown the same pattern.During the same election, U.S. Rep. Mike Coffman (R-CO) said he’d take on Trump, and he’s since voted with the President 96 percent of the time. Not only is it working, it's Making America Great Again! GOP will hold the Senate. Now that you have said that, I have my doubts they will. So, what does a "Great America" look like? Non-white children in concentration camps? Spineless fascists bowing and scraping for the orange Fuhrer? Stay the course, Senator. Some day they will thank you. That "thank you" might look like getting booted out of office. They being the rich and richer. What a toady for the wealthiest in our nation. True dat. Until Moderapist made that prediction, the GOP increasing its lead in the U.S. Senate was virtually assured. Now it's all up in the air. I rather make America better. Better able to handle natural disasters. Better able to speak civilly with each other. Better people by leaving our social safety nets in place. A better place to live in harmony with our planet. I want a Better America Moldy. Sure Gardner rollbacks, like have an EPA that will protect our public lands and water. 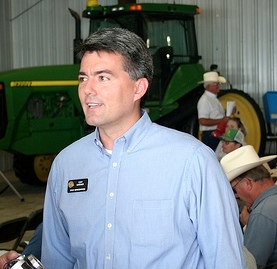 Gardner will support the traitor Trump in downsizing our national parks and forest lands to allow drilling and mining on them just like in Utah. I can't wait to vote the piece of garbage out of office.